Patricia Hruby Powell won awards for her picture book biography, Josephine: The Dazzling Life of Josephine Baker (Chronicle Books). 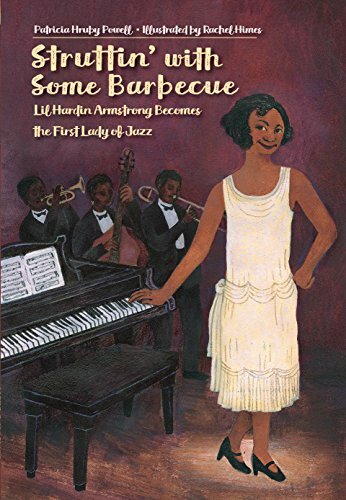 In Struttin' with Some Barbecue, she shines a light on another talented African American performer, Lil Hardin, a successful jazz pianist in her own right who went on to marry Louis Armstrong. The lively text makes for a fun read-aloud, though the subject matter is for an older audience. was proud to be who she was. Her mama made sure of that. The catchy blank verse makes the story easy to read, as well as giving a sense of the jazzy music both Hardin and Armstrong played. Powell describes vividly Lil's journey from classically trained pianist to jazz performer while the black and white illustrations by Rachel Himes provide lively characterizations of Lil and her world. The book paints a picture of Lil as driven not just in her own career but pivotal in Armstrong's. Although the couple later divorce (as described in the backmatter), the book ends on a high note, the two playing together as “musical royalty.” For readers who want to know about Lil and her much more famous husband, there is additional information to follow up on, including suggested reading and songs to listen to. Struttin' with Some Barbecue provides an important introduction to a musical figure most people won't have heard of, along with the story of her better-known partner.